I absolutely love candles, so I was really excited to receive a mini candle from Bath & Body Works for free in my Influenster Beauty Blogger VoxBox! I've used candles from Bath & Body Works for years, and they are probably my absolute favorite candles. They are highly fragranced and made of vegetable wax. They also have lead free wicks. Their candles come in 4 sizes ranging from these minis to their large 3-wicks. They sell candles made by both Slatkin and White Barn, and both are very high quality. They come in a huge variety of scents! They have regular year round scents and they also have a huge assortment of seasonal scents, as well as limited edition collections. 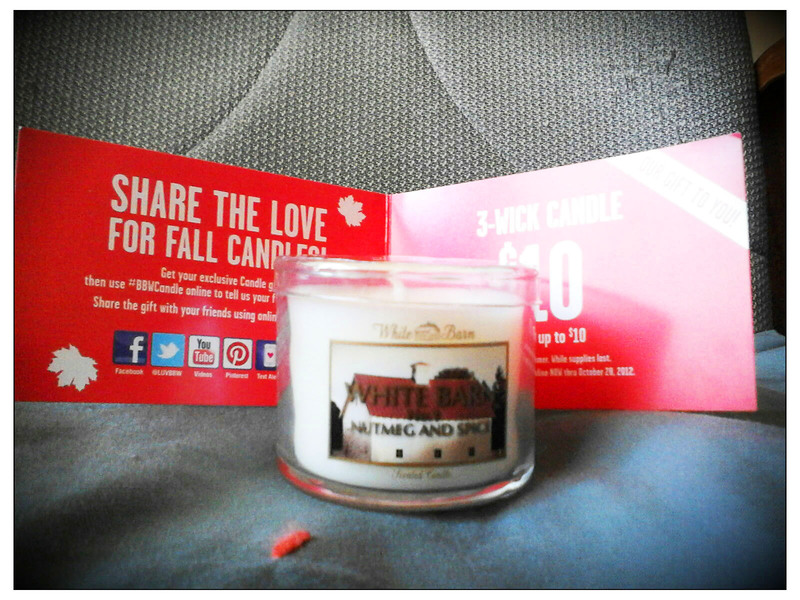 The scent I received was Nutmeg and Spice by White Barn. This scent is described as "a cozy concoction of spiced caramel and nutmeg", and it is a nice, warm, sweet, spicy scent. This is a new scent to me and I really love it! It made my entire apartment smell warm and homey and welcoming. If you like warm, cozy, spicy scents, I definitely recommend this one! Other scents that are currently available that I have personally tried and loved are Cider Lane, Leaves, Marshmallow Fireside, Frosted Cupcake, Creamy Pumpkin, and French Baguette. You can get these mini candles for 2 for $5 at (http://www.bathandbodyworks.com. I think the fall and winter scents are the best ones, so I plan to stock up before the holidays! Have you tried these candles? What are your favorite scents? *Disclaimer: I received this product free of charge. I was not otherwise compensated and all opinions are my own. I love their candles!! great review and cool blog! Found you through the getting to know you hop! I've never tried their candles but I always hear such good things! Definitely something I want to try out, great review! This is the same scent I received! I love it. I'm definitely picking up a full size. I think their candles are the most strongly scented ones! My favorite. I just wish they were cheaper!